Fairfax ENT is proud to offer in office Balloon Sinuplasty. A clinically proven, minimally invasive technology for treating chronic sinus inflammation without the need for surgery or anesthesia. The Balloon Sinuplasty™ system by Acclarent™ uses a small catheter and balloon to quickly open and expand blocked sinuses. Sinusitis is one of the most common chronic health problems in the U.S., afflicting 37 million Americans each year. Patients suffer headaches, congestion, fatigue and other symptoms. This condition significantly impacts an individual’s physical, functional, and emotional quality of life. Historically, sinusitis patients were limited to two treatment options: medical therapy such as antibiotics and topical nasal steroids, or conventional sinus surgery such as Functional Endoscopic Sinus Surgery (FESS). Medical therapy can help alleviate symptoms as many as 80% of patients but is inadequate for the rest. For them, sinus surgery is often the best option. However, FESS is a conventional surgery that requires bone and tissue removal in order to open up blocked sinus passageways. In lieu of a desired treatment, approximately 900,000 patients each year elect to live with painful sinus conditions. There is an alternative solution in endoscopic sinus surgery with the Balloon Sinuplasty™ technology by Acclarent. A small, flexible balloon catheter is placed through a nostril into the blocked sinus passageway. The balloon is then inflated to gently restructure and open the sinus passageway, restoring normal sinus drainage and function. 95% of patients who have had Balloon Sinuplasty say they would have it again. Many harmful stereotypes exist regarding snoring. Not only are they untrue, but they may also contribute to shame and embarrassment, which prevents patients from seeking treatment. Most commonly, snoring is associated with males, and people who are overweight. However, many people who are physically fit suffer from snoring. Plus, of the 90 million Americans who snore, about one third of them are women. You are not alone. Snoring is generally related to an anatomic problem, not gender or hygiene. Though you should not be ashamed of snoring, you should take the condition seriously. Women who snore are more likely to suffer heart disease, cardiac complications, and stroke. Drs. O’Halloran, Egan, and Scheidemandel will help you understand, diagnose, treat, and manage your snoring and associated problems. Unfortunately, many users find the mask uncomfortable or inconvenient, and reduce use without consulting their doctor. Other patients may experience dry mouth, or complain that the noise produced by the machine actually makes sleep more difficult. Drs. O’Halloran, Egan, and Scheidemandel will help you determine the best method of treatment for your OSA, and may be able to adjust your machine and mask for optimal comfort. 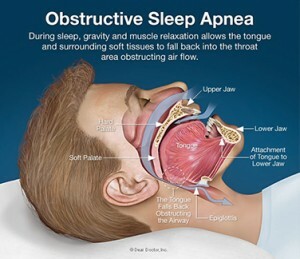 Sleep apnea is a condition where your breathing stops or slows down while you sleep. The pauses can last from a few seconds to almost a minute. Repeated cycles of decreased oxygenation lead to very serious cardiovascular problems. Additionally, these individuals suffer from excessive daytime sleepiness, depression, and loss of concentration. Recent Studies have shown that patients with obstructive sleep apnea are at increased risk for high blood pressure, stroke, heart disease, diabetes and depression. Sleep apnea is a very common condition but unfortunately most patients with sleep apnea are not aware that they have a problem. The only way to diagnose sleep apnea is with an overnight sleep study. The key is to determine who is a risk for sleep apnea and referring this individuals to be tested. Dr. O’halloran and Egan use a detailed history and thorough physical exam to determine if a patient is a candidate for a sleep study. The doctors will assess the anatomic relationships in the maxillofacial and nasal airway. Sometimes a naso-pharyngeal exam is done with a flexible fiber-optic camera. A sleep study or polysomnogram is an overnight sleep test that physicians often prescribe to patients with sleep disorders. The polysomnogram, often called a PSG, measures and records activity during sleep. The PSG monitors many body functions such as brain activity, eye movements, muscle activity, respiratory airflow, and heart rhythm during sleep. It is important to remember that a polysomnogram is a not a test, but instead a painless, in-depth recording of how well you sleep. After you complete your overnight polysomnogram, our board certified sleep medicine physician will review the data collected to look for sleep apnea. The polysomnogram will also reveal the severity of the disorder and give the physician guidance to the proper treatment to prescribe. If the results of your polysomnogram reveal that you have sleep apnea you doctor will likely recommend that you have a CPAP Titration. The CPAP Titration is identical to a polysomnogram with the addition of a medical device known as a continuous positive airway pressure machine (CPAP). This machine blows pressurized air into the nose via a mask in order to eliminate the snoring and pauses in breathing that sleep apnea produces. The CPAP Titration is an overnight sleep study used to determine the minimal effective pressure to eliminate the sleep breathing disorder. The test also ensures that you have been given a comfortable mask that will produce the best possible results. An initial treatment may consist of using a nasal CPAP machine that delivers pressurized oxygen through a nasal mask to limit obstruction at night. CPAP is the most effective treatment option for sleep apnea. If a patient cannot tolerate a CPAP mask or is unwilling to use a CPAP mask there are other options available. Another option is an oral appliance that is worn at night and pulls the jaw and tongue forward slightly to increase the size of the airway. OSA is a very serious condition that needs careful attention and treatment. Most major medical plans offer coverage for diagnosis and treatment. Snoring results from an often-complex multi-facial problem that can be affected by one or more anatomical factors. For most sufferers, snoring is caused by the vibration of the muscular roof of the mouth, also known as the soft palate. For others, snoring is worsened by an obstruction of the nasal passage. An enlarged uvula, tonsils, and the base of the tongue can also contribute to the problem. There is no reason to be embarrassed about snoring, or to feel alone. Snoring is a common problem, with 90 million Americans suffering from the condition. While snoring can have a negative impact on your personal life, it can also negatively affect your health, and should therefore be taken seriously. Daytime drowsiness, decreased libido and energy, and even depression can all result from snoring. More serious problems such as an increased risk of heart attacks and stroke, type 2 diabetes, weight gain, and high blood pressure can also result from habitual snoring. Do not wait to have your snoring problem examined. Drs. O’Halloran, Egan, and Scheidemandel can help you determine the cause and a course of treatment for your snoring, which may help save your relationships- and your life! Over 18 million Americans have sleep apnea. Only 10% are being treated for their sleep disorder. I frequently wake up to use the bathroom. It is hard for me to stay awake while driving. I have fallen asleep while laughing or crying. I wake up with pain and numbness in my legs. I have difficulty falling asleep or remaining asleep. I have been told that I stop breathing while I sleep. If two or more of the statements above apply to you, this may indicate a serious sleep disorder. Please consult your physician today regarding a diagnostic sleep study. Fairfax ENT physicians will help you find a treatment that is right for you.